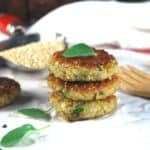 Vibrant, crispy, vegan Garlicky Zucchini Quinoa Cakes make a perfect brunch or snack. This recipe is low-fat, gluten-free and nut-free. 1 medium zucchini, grated and placed in a bowl with 1/4 tsp of salt. Squeeze out the zucchini after 15 minutes but reserve the water. Mix all of the ingredients in a large bowl. If the mixture is too dry to hold, add some of the water you squeezed out of the zucchini. Form into small cakes. I like to make these rather small so they get really crispy. Coat a large skillet or griddle with some oil. When the oil's hot, add the cakes in a single layer, leaving at least an inch between each, and cook in batches, flipping over when each side is golden and crispy. Serve hot by itself or with some chutney.